Are you a long-distance runner? A sprinter? A high jumper? A swimmer? An ice skater? Are you completely committed to your sport? Willing to practice hours and hours every day, including weekends and holidays? To give up time with family and friends? To choose practice instead of movies or other entertainment? If you said yes to most of these questions, you just may have the makings of an Olympic athlete. The Olympics is a group of athletic competitions held every four years. Some games are held in the summer, and some in the winter. Practically every country in the world sends athletes to the Olympics. Competitors who “medal,” or win medals, earn honors for both their country and themselves. Running included a 1-stade sprint, a 2-stade race, and a long-distance run of 7 to 24 stades. (A stade was the length of a stadium, about 192 meters, or 210 yards.) A fourth event included a 2- to 4-stade race run by athletes wearing 50 to 60 pounds of armor! Boxing had many fewer rules than today’s sport. Boxers fought until one man was knocked out or admitted being beaten. There were no weight classes, no rules against hitting an opponent who was on the ground, and no gloves. Instead, boxers wrapped their hands and wrists in leather, leaving their fingers free. Wrestling required contestants to throw their opponents down three times to win a match. During the match it was “legal” to break your opponent’s fingers, but not to bite him. Equestrian events included chariot races of 12 laps around a track and races similar to today’s horse racing, but without a saddle. Pentathalon was a five-part event modeled on the skills of an ideal soldier. The events included running, wrestling, long jump, javelin throw, and discus throw. Long-jump athletes gave their jumps a boost of extra distance by holding a weight in each hand and then forcefully throwing the weight behind them as they landed. The javelin was a spear-shaped length of wood with a metal point or a sharpened end. The discus was a round stone or iron disk that looked like a Frisbee without the curved rim. Today’s Olympics include sports as diverse as taekwando, beach volleyball, and snowboarding. And the list is always changing. Women’s boxing was added in 2012; tug-of-war (yes, the game with a rope that you and your friends may have played) was dropped in 1920; and rugby is slated to become an official Olympic sport in 2016. The number and types of events are not the only changes that have taken place over time. Back in the day, only males could compete in the Olympics, and only if they were Greek and free (not enslaved). Unlike today, when men and women compete in parallel events, unmarried women could not participate in the ancient games, and married women were not even allowed to attend. Location is another difference between the ancient and modern games. These days, the Olympics take place in different cities around the world. 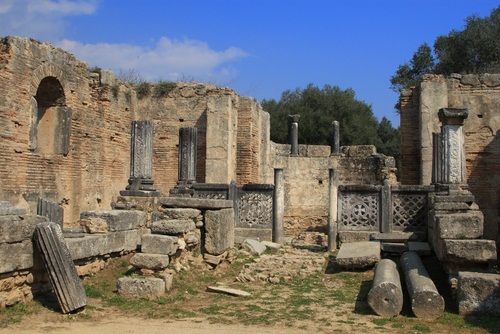 In ancient times they were always in Olympia, a religious center in western Greece. Boys and men — from “lowly” shepherds to generals and the sons of kings — traveled great distances from the many regions that Greece controlled to compete in honor of Zeus. Artists, poets, and others also gathered in Olympia during the games to show their work and look for sponsors. During the ancient competitions, all conflicts between Greek city-states ceased. In modern times, however, combat has caused the cancellation of the Olympic Games three times: in 1916 during World War I and in 1940 and 1944 during World War II. While there is some disagreement, most historians believe that the last of the original competitions was held in A.D. 393. At that time, the Roman emperor who controlled Greece, considered the Olympics to be “pagan cults” and banned them. More than a millennium would pass before the games were held again. 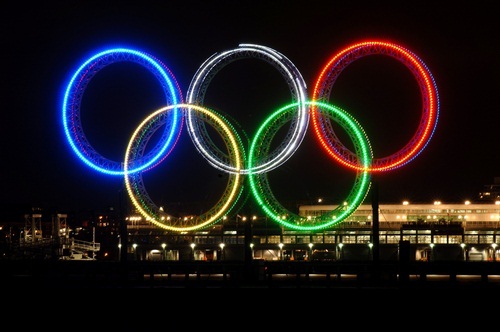 In 1894 the International Olympic Committee was founded. Two years later the first modern Olympics were held. 1900 Women first competed in the Olympics in Paris. Their sports were lawn tennis, croquet, and golf. Today, all events have competitions for men and women, including boxing. 1908 The length of a marathon was officially set at 26 miles and 385 yards, the distance between Windsor Castle in England and the royal box in the Olympic Stadium. Why? The queen asked that the marathon start at Windsor Castle where the princess and her children could watch and that it end at the royal box, where the queen could see the finish. 1912 The last year solid gold medals were awarded. Now, gold medals must be coated with a minimum of six grams of gold. Silver medals must be at least 92.5% silver. 1920 The year the official Olympic flag was first used. The flag consists of five colored rings on a white background. The number of rings represents the five continents where people live, counting North and South America as one. The colors of the rings — red, yellow, green, black, and blue — and the white background were chosen because each color appeared on the flags of the countries in the world at the time. 1924 Winter Games were added, including skiing, bobsledding, skating, ice hockey, and more. 1928 The Olympic flame was introduced in honor of the ancient games at Olympia, where fires were kept permanently lit in front of temples to Zeus and other Greek gods. At every modern Olympics, the fire burns throughout the games. 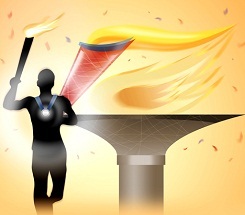 1936 The Olympic torch relay came into being. 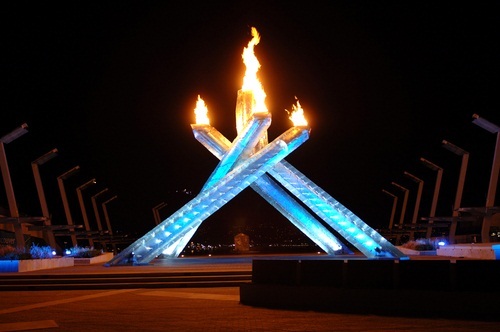 The torch, lit in Olympia by concentrating the rays of the sun, is carried to the host city via a pre-determined route. Along the way, the flame is passed from hand to hand by thousands of torch bearers. Representing the truce maintained during the ancient games, the torch relay carries a message of friendship and world peace. 1948 The first Paralympic Games were held. The Paralympics are an international event for athletes with physical disabilities that coincides with the Olympics. Originally intended for veterans of World War II and limited to people in wheelchairs, the Paralympics have expanded to include events for people with visual impairments, lost limbs, cerebral palsy, and other disabilities. 1960 Abebe Bikila of Ethiopia ran the marathon barefoot and won. 1968 The first Special Olympics Summer Games were held. Founded by Eunice Kennedy Shriver, the Special Olympics are an international event for athletes with intellectual disabilities. Winter and summer games are held alternately every two years. 1976 Shun Fujimoto, a key member of Japan’s gymnastics team, broke his kneecap while doing the floor exercise in competition. Nevertheless, in agonizing pain he competed the next day and won gold for himself, his team, and his country. 1988 For the first time, tropical island Jamaica participated in the bobsledding competition. 2008 Michael Phelps won eight gold medals for swimming, the highest number ever won by one person in a single Olympics. 2012 Women’s boxing is added as an Olympic event, creating competitions for both men and women in every Olympic sport. Michael Phelps may be the world’s single best swimmer. But that doesn’t come easily. 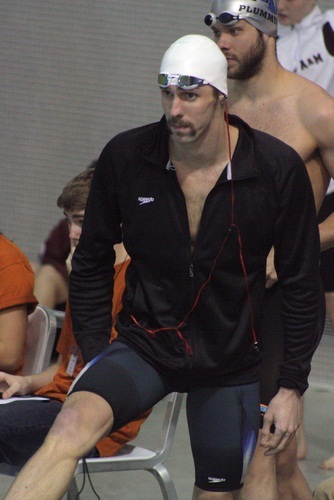 While in training, Phelps swims five to six hours a day six days a week. Plus, he follows a weight-lifting routine three days a week. Phelps wasn’t always a swimmer though. When he was seven, he was frightened to put his head under water! If you have Phelps’ dedication, there still may be time for you to train for the next summer Olympics. See you in Rio de Janeiro in 2016!